A Lee man died Saturday night after his snowmobile crashed in Springfield, according to the Maine Warden Service. A Lee man died over the weekend in a snowmobile crash in Springfield, the sixth fatality of the season. John Dorsey, 52, left a friend’s house about 9 p.m. Saturday on his 1999 Arctic Cat Panther 440, according to Cpl. John MacDonald, spokesman for the Maine Warden Service. 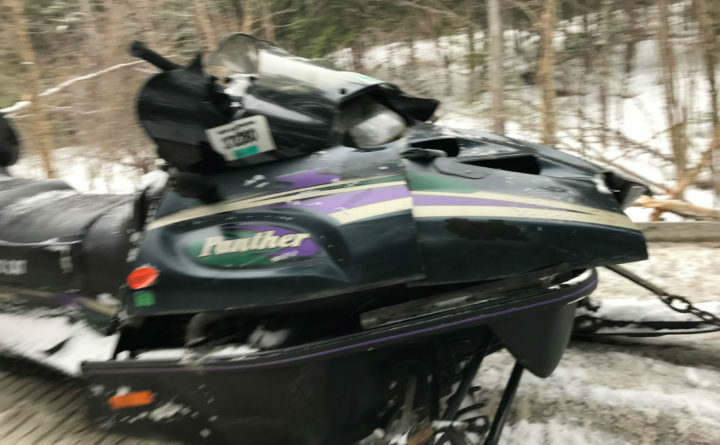 Dorsey was riding his snowmobile along Buckshot Road when he failed to negotiate a corner and struck a tree, MacDonald said. Dorsey, who was wearing a helmet, died at the scene. The crash was found about 11 a.m. Sunday when a man going to visit a residence on Buckshot Road came across it, MacDonald said. Dorsey’s snowmobile was still running despite extensive damage. MacDonald said the crash remains under investigation, but game wardens believe speed and alcohol contributed to the crash. It was the sixth snowmobile fatality of the season and the fourth in February. On Feb. 17, a Massachusetts teen and a Norway woman died in separate snowmobile crashes in central Maine. On Feb. 9, a pregnant woman from Massachusetts died after her snowmobile crashed in Greenwood.